N.B. another review on the same book, written by a Nobel Prize Laureate in Physics. This Foreword was prompted by publication a new book about quantum mechanics. I love reading Lee Smolin, but I'm not going to read this book. 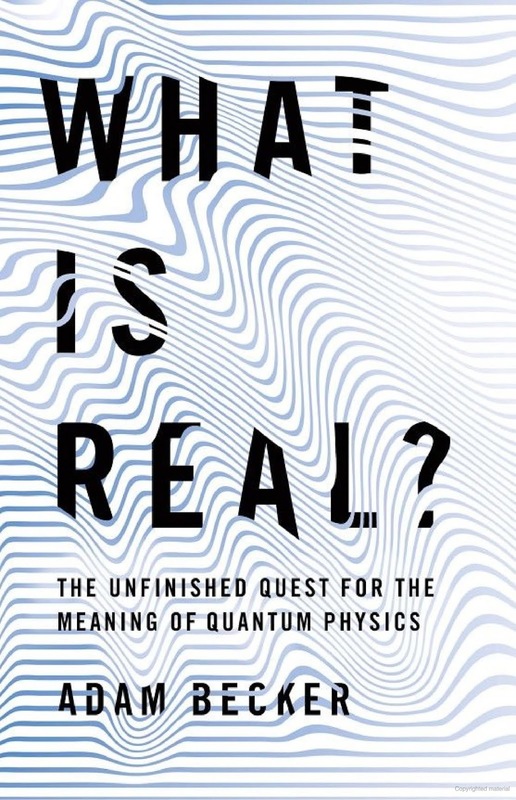 In this book at first he criticizes all existing interpretations of quantum mechanics, and then he promotes his own. However, I prefer sticking to the interpretation which satisfies the Occam's razor test (and described in the series of my posts). The first one is that quantum mechanics works. The second one is that quantum mechanics is not a complete theory – that is why there are several interpretations of why it works. The third fact, however, the fact of the matter is that this situation is not the first, not the only, and I'm pretty sure not the last one in physics and in science in general when a working theory exists, but the reasons for why it works aren’t clear and different factions of scientific community hold different views on that matter. For example, more than 2000 years ago the world knew only a few true physical theories – one of those was the Archimedes’ theory of a lever. The lever has been known for thousands of years before Archimedes, but he was the first one who gave a detailed mathematical description of how it works. But only a couple of thousands of years later physicists could explain why Archimedes’ theory worked. This maybe is not the perfect example, but it works as an illustration. Physics is not alone, other sciences also have similar examples: for example, no one denies evolution, species do evolve. But the theory of evolution, that one that answers the question why do species evolve – is a different story; Darwinism is not the only one, there are, or at least, there were alternatives. So, quantum theory works, we know how to use it to describe quantum world, but we do not know why it works. And the only reason why so many physicists are still bothered by the latter fact is that quantum theory is very different from clear and logical classical mechanics. So far, all attempts to fit quantum theory in the same logical frame that works for classical mechanics have failed. Most physicists believe that because a classical, i.e. macroscopic, world represents a composition of a large number of quantum, i.e. microscopic, worlds, the logical and mathematical description of both worlds must be connected in a clear and logical way – classical laws must be “derived” from quantum laws, and quantum laws must be “derived” from classical laws. Here we already run into a debate – because different scholars have a different meaning for term “derived”. At the dawn of the quantum era, to demonstrate how different quantum mechanics is from classical mechanics physicists invented paradoxes. One of such well-known paradoxes was “Schrödinger’s cat”, and another one “EPR paradox”. What readers need to understand that a hundred years ago those paradoxes played an important role as discussion generators. But today, a hundred years later, we have a much better understanding of what works and what does not work in quantum mechanics, including the meaning of those old paradoxes. A historian may keep uncovering more and more nuances in those hundred-year-old discussions. But a physicist needs to focus on the current understanding. And again, the history of science knows very similar situations, when for many years a paradox was a nucleus of many heated discussions, but was resolved and now it has only historical value. My favorite paradox of such type is Zeno’s paradox that says that a runner cannot ever run a mile (the Dichotomy paradox). Now we know that the sum of an infinitely many terms can have a finite value. In conclusion, we know that quantum mechanics is very different from classical mechanics, we know that we don’t know why a quantum theory works, and that realization leads to different theories about a quantum theory, known as interpretations. How do we select that one which we like the most? Everyone has a different approach. I always use the Occam's razor and select an explanation which requires the least amount of reasoning, the smallest number of assumptions, and the most natural assumptions. Such interpretation of quantum mechanics exists. And in the series of post on this page I tried to offer a description of this interpretation and explain why this interpretation is the best one – so far. P.S. This post is one of the posts the origins of quantum mechanics: The Core Assumption of Every Known Single-Photon Experiment Is Wrong, Freeing The Schrödinger's Cat I (has an additional discussion of the general methodology of science); Freeing The Schrödinger's Cat II; The Uncertainty Principle; The Origins of Quantum Mechanics, and Part II of this book review. From my first encounter with Quantum Mechanics I was fascinated by it. I also immediately “knew”, or rather was convinced, that Quantum Mechanics was, and still is, not a theory, but a “cooking recipe”. A mathematically and conceptually complicated, sometimes counter-intuitive, but just a recipe: the prescription of actions found via a trial and error, exactly like cooking. As a soon-to-be theoretical physicist (who had not idea that later in life would switched to education), I was convinced that since the world is a united undivided space-time continuum filled up with matter in the form of moving objects and changing fields, there has to be one united undivided universal theory describing the whole world. When a scientist would need to describe a specific subset of natural phenomena, that universal theory would be used in a simplified form of a specific theory the best suited for that type of phenomena. For example, to describe the mechanical motion of a small number of slow moving objects one would use the Newtonian Mechanics. But the Newtonian Mechanics represents a special case of the Relativistic Mechanics; the special case which is described by the equations derived as a mathematical limit of the equations for the Relativistic Mechanics when the speed of the motion of all objects is much lower than the speed of light in vacuum. Physicists have established similar relationships between the Newtonian Mechanics and the laws of Thermodynamics and Gas Laws; between the Newtonian Mechanics the Navier-Stokes equations describing the motion of fluids; between the General Theory of Relativity and Special Theory of Relativity. The Quantum Mechanics, as a highly successful recipe, formally includes a transition from the laws of Quantum Mechanics (e.g. in the form of the Schrödinger equation) to the Newtonian Mechanics (e.g. in the form of the Newton's laws). In a way we can say that the Quantum Mechanics explains why Newton's laws work. But there is no yet a commonly accepted theory which explains why the Quantum Mechanics works. There are only possible interpretations of that. After getting an A for my Quantum Mechanics course, I did not lose the interest to the fundamentals of the Quantum Mechanics. In time, I read four or five more standard textbooks on the Quantum Mechanics, and at least as many books on the philosophy and fundamental principles of it (I even posted a couple of pieces of my own; one on the Heisenberg Principle, and another one on Quantum Entanglement). 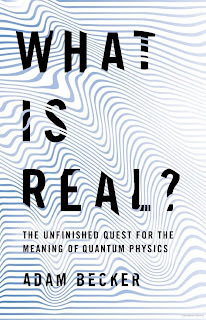 The recent book on the matter “What Is Real?” by Dr. Adam Becker attracted my attention by good reviews, so I purchased it. When I started to read it (and I am still in the process – unfortunately, my reading time is not as available as I would wish), I knew I would not learn much new on the origins and philosophy of the Quantum Mechanics. But I am always eager to learn something new on the history of the scientific battles between different scholars, different groups of scientists, which happens a lot, even in physics. People seem to think that science is something like the wisdom inscribed in tablets, and scientists just dig them out and reveal to the public as a discovery. In reality, the practice of science is not much different from all other human practices (think of acting, for example); it is developed as the result of a constant struggle between different groups with opposing interests (funds, fame). The only difference between science and other human practices is that in science people have a procedure which eventually allows to differentiate between “winners” and “losers” (BTW: that procedure is called an “experiment”). Scientists are human, and they act like all humans do – in the best interests of their own. And BTW, many scientists simply “don't know what they do”. I mean they do know what project they work on, the goals of that project, what they want to achieve. But if you ask them about a big picture, if you ask what is science and how does their project fit in science in general, you don't get an articulate answer, because most scientists simply don't think about things like that. “What do you do? Science. What is science? Hmmm … So, you don’t know what you do? Hmmm …” No wonder, scientists cannot clearly explain the difference between science and religion, and STEM education is in a state of struggle. There is a common misunderstanding that the motivation for a scientist to do science is curiosity. First, no one, even a scientists needs curiosity to achieve success in life. In science, the NSF - the most important funding agency - does not value curiosity, it values appeal and appearance. Curiosity is just a psychological predisposition to trying things. It is like hunger. You feel hunger, you start looking for food. But maybe in time you will figure out that making food also can make you rich and famous, and you become a chef. Same in science; the true locomotive of sciences (read, scientists) is the two big Fs - Fame, and Funds. While growing up they - future scientists - got fascinated by something. Maybe it was a book, a parent, a friend, a teacher, a movie, or something else which influenced them, but the main reason they started doing science is just they liked it and they were good at it. One thing led to another and here they are, having a PhD. But the majority of scientists are practitioners, they are practicing in the field of their science and they don't usually think about the philosophical basis or fundamental principles of the science they do. They just have no time and taste for that. The Dr. Adam Becker’s book is promised to describe some examples of the battle between different groups of physicists about the origins of the Quantum Mechanics. But immediately after starting reading the book, I ran into multiple examples of contradictory or illogical statements. This fact has prompted me to write this piece. I hope, my further reading will inspire me for my further writing (this is why I called this one “Part I/one”). I would like to start from these two quotes: “And one position in that debate – held by the majority of physicists and purportedly by Bohr – has continually denied the very terms of the debate itself” (page 5). “The popularity of this attitude to quantum physics is surprising” (page 6). These statements indicate that Dr. Becker is simply not familiar with the views beyond the ones represented by English-speaking writers. For example, in all Russian textbooks on the Quantum Mechanics the debate has been settled; the quantum world is real, it can and has to be described in the terms of the observable variables, there is still though a technical debate on how to reconcile the quantum (microscopic) world description (i.e. the Quantum Mechanics) with the human (macroscopic) world description (i.e. the Newtonian Mechanics). In Russia, physics is based on a specific philosophy of science, called Materialism, and the philosophy described by Dr. Becker is called Positivism and deemed wrong (for better or worse – that is not the topic of this piece). So, what Dr. Becker should have written is “The popularity of this attitude to quantum physics in the English-speaking sciences is surprising” (with the exception of David Bohm). Since the “Introduction” Dr. Becker uses statements which already depend on a specific interpretation of Quantum Mechanics, however, without mentioning that fact. For example, he writes: “The atom doesn’t split, it doesn’t take one path and then the other – it travels down both paths, simultaneously” (page I/one). This description represents only one of possible interpretations of the motion of a quantum particle discussed in the physics world. Among other interpretations, there is one, namely, a statistical interpretation, which states that an atom takes one and only one path; but another atom in the same situation may take a different path, and there is math which tells us the chances for each path to be taken. I am not saying that the statistical interpretation is better (it is), I just want to stress that the assertion that an atom “travels down both paths, simultaneously”, describes the author's point of view, and not the only possible point of view, but the readers are led to believe that other points of view do not exists. And that is on page I/one of the “Introduction”. The view that when a quantum particle is presented with two paths to travel, it “doesn’t split, it doesn’t take one path and then the other – it travels down both paths, simultaneously” is very common for scientists who exercise the philosophy of Positivism. This view, however, leads to a very strange world picture, which, from my point of view, cannot be correct. What if a quantum particle is presented with three paths to travel, or four, of five, or seven thousand thirty-six? The same logic forces us to say that it “doesn’t split – it travels down seven thousand thirty-six paths, simultaneously”. What if there are no physical obstruction at all and a quantum particle can travel in any direction using any – meaning, all! – path(s)? In that case, it “doesn’t split – it travels all paths, simultaneously”. Meaning, it is smeared all over the universe. So, it is not a particle any more, but an actual physical field. And that view should be applied to all existing particles at the same time, which now are all fields smeared all over the universe. This view may exist (“a wave function is a real physical field”). However, using this view is hard to explain how a single electron makes a spot on a photo-plate when it collides with the plate (and many more experiments). This discussion would require to invent a process similar to a “collapse of a wave function” but applied to an actual physical field (now, the field is all over the universe, and a fraction of a second later, it is only at this point). And it would be even harder to explain how this picture leads to the Newtonian description of our macroscopic world. It is just easier to choose a different interpretation, namely, the statistical one; and the Occam's Razor principle says, if it’s easier, it’s better, so – use that one. It also automatically answers the question: “Why aren’t our keys ever in two places at once?” (page 2). Because nothing is; not keys, not stars, not atoms, not electrons – nothing. I do understand the need of an author to make some impressive statements or ask mysterious questions, but a scientific book should not mislead readers. Asking a question which make no sense is a nonsense. An example of such nonsense is asking: “where an electron is” (page 16) without having described the specific physical situation. Asking “Where an electron is in a Hydrogen atom” is a nonsense. Asking “Where an electron is when it hits a photo-plate” is a legitimate question. The discussion of the meaning of “measurement” (page17) without bringing into it different interpretations of the Quantum Mechanics is pointless, because various interpretations of the Quantum Mechanics differ by the very definition of “measurement”. On page 17 Dr. Becker writes: “The predictions of quantum physics are generally in terms of probabilities, not certainties. And that’s strange…”. Well, using probabilities may seem strange for a regular person, but it definitely cannot be seen as strange for a scientist. The fact that one probabilistic function (e.g. a wave function) is defined by a deterministic equation (e.g. Schrödinger equation) is not new and no different from other functions and equations used in physics for describing probabilistic behavior (e.g. N-particle distribution function, for which the time evolution is governed by the Liouville equation). Probability is as the part of physics as the determinism. What drastically separates the Quantum Mechanics from any other probabilistic theories, is not the fact that we have to calculate probabilities of different events, but the fact that we cannot use any equation which describes probabilities per se, which tells us how to calculate those probabilities on their own. Instead, we have to calculate a wave-function first, only then we can find the probabilities we need. The recipe (which has several but mathematically equivalent forms) is simple: 1. Guess the Hamiltonian for your system (there are some hints for that); 2. Solve the Schrödinger equation for eigenstates (does not matter what they are, it’s just math); 3. Calculate the amplitudes (does not matter what they are, it’s just math) of the eigenstates for a wave-function of your choice, including their time evolution, if you want; and then 4. Calculate squares of the absolute values of those amplitudes (just some more math) – the resulting numbers will give you the probabilities you are looking for. Why do we have to use a wave-function, but not actual probabilities? Why does the universe make us using wave-functions instead of actual probabilities in the first place? Here is where scientists get divided into different groups. Some just ignore the question or say that this question does not make sense, so, “shut up and calculate”. Some say that this question makes sense, but it is not worth spending time on searching for the answer, or we will never be able to find the answer to it so, again, just “shut up and calculate”. And some are still trying to find the answer to this question – those people represent the tiny fraction of all scientists, but those are the people who will eventually make a breakthrough in quantum physics. This feature of the Quantum Mechanism, i.e. the need for the use of a wave-function instead of probabilities, is the root of all mysteries of the Quantum Mechanics (go ahead and just Google “mysteries of Quantum Mechanics”). Finally let's talk about the main topic of this piece, i.e. the “Schrodinger’s Cat” thought experiment. I have read many interpretations of that experiment. If I wanted to discuss the history of physics, probably, I would have to learn German and then read the original paper to make my own interpretation of what Schrödinger wanted to say. However, since we talk about the physics behind that experiment, we don’t have to go through the whole ninety-year old discussion. All we need is the description of the experiment, and then we can make our own interpretation, based on our own contemporary version of the meaning of the Quantum Mechanics. I start from the copy of the description of the experiment provided by doctor Becker in his book. “Schrödinger imagined putting a cat in a box along with the sealed glass vial of cyanide, with a small hammer hanging or the vile. The hammer, in turn, would be connected to a Geiger counter, which detects radioactivity, and that counter will be pointed at a tiny lump of slightly radioactive metal.” (page 3). 1. All cats are alive. 2. All cats are dead. 3. Some cats are alive and others are dead. If all cats are alive the best explanation is that we made a mistake and instead of using the radioactive metal we placed some stable material. If all cats are dead the best explanation is that we didn't have enough boxes, or the radioactive metal had much higher radioactivity then we thought. But since it is our thought experiment, we can imagine that we are smart enough or lucky enough to have the right number of boxes and the right type of the radioactive metal, so once we open all the boxes, what we see is that some cats indeed are alive and some cats indeed are dead. In order to make this conclusion about what we would see if our thought experiment would actually happen, all we need to know is that within a specific time interval a radioactive metal may or may not emit a particle. 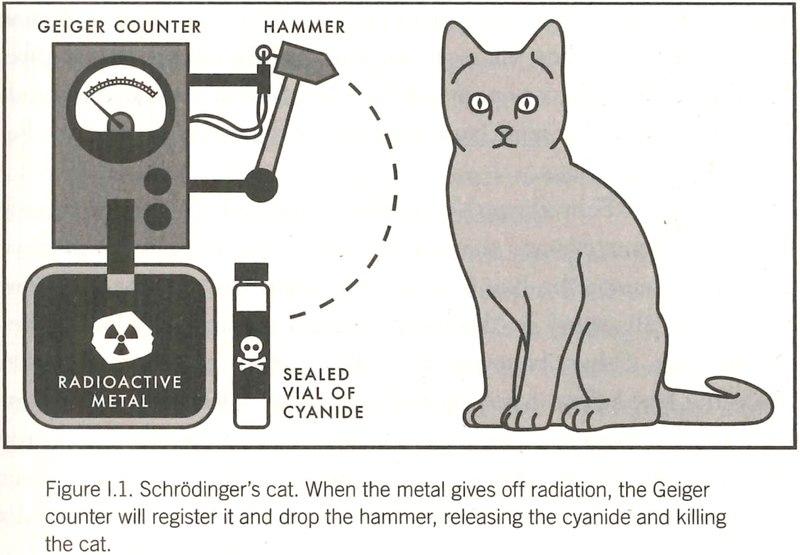 Based on this property of a radioactive metal we can say that, indeed, every cat inside each box may or may not be alive or dead. However, there is simply no logical reason to make a statement that until the box was opened a cat inside it is dead-and-alive at the same time. “No logical reason” does not mean “no reason at all”; such a reason, for example, could be “I just want it to be”. Let's assume for the moment that all cats in all boxes were in a state of dead-and-alive right until we opened the doors. Let’s assume that it was the action of opening the door of each box which has led to some cats become dead, and for some cats remain alive. In that case, all the alive cats would look exactly the same – happy. But also, all the dead cats would look exactly the same, with no sign of any deterioration. My common sense and everyday experience doesn't believe in that picture. My common sense and everyday experience says that different cats in different boxes would die at different time (right after a radioactive particle left the metal and entered the counter), so when all boxes are opened, we could see one cat that died a long time ago, and another cat that just recently passed away. The time of death would be based on the time when the vile with the poison was broken, which was based on the time when the counter registered a particle, which was based on the time when the radioactive metal emitted that particle via radioactivity decay. 1. A cat inside a box is either alive or dead, and before we open the box there is no way to know if the cat is alive or dead. 2. There is a specific instant in time before which a cat inside a box is alive, and after which the cat is dead, but there is no way to predict the value of that instant (which, in principle, includes such values as "always" and "never"). 3. A cat inside a box may die, and if that happens, when we open a box we will see a dead cat, and we may be able to find out how long the cat was dead before a box was opened (hence, when after the start of the experiment the cat died), but before we open the box we will never be able to predict when exactly the cat would die. 4. Using multiple experiments we may be able to find the chance of finding the cat alive (or the time distribution of the moments when the cat becomes dead). Of course, Schrödinger used a cat just for a dramatic effect – a death-or-life situation definitely sharpens the argumentation of the case. But it does not have to be a cat. Instead of a vial and a cat one could use a timer with a button pushed by a falling hammer. The physical behavior of the system would not change. It still would describe the same act of an interaction between a microscopic and a macroscopic systems (a.k.a. “measurement”). My interpretation of the “Schrödinger’s Cat” thought experiment implicates that statement: “the subatomic particles in the metal… don’t know whether they should stay or they should go. So, they do both” (page 3) is wrong (or at least depends on a specific interpretation of the Quantum Mechanics, hence, inaccurate). Statistical interpretation of the Quantum Mechanics paints a much simpler, hence less dramatic, but hence clearer, hence more practical, hence more workable, picture, i.e. the subatomic particles in the metal remain intact until they, independently from each other, at the moment which may be different for different particles, at the moment which is intrinsically not predictable, “go”. A patient and accurate experimenter, though, can find out (with a reasonable certainty) what is a chance for a given particle “to go” (during a given time interval). I hope that now all the “cat killing” has finally come to the logical end. Cats, timers, particles, any existing objects, cannot “take two paths at the same time”, or “stay and go simultaneously”. They can do one or another; for each choice, there is a specific probability of that to happen; that probability cannot be found on its own but requires calculating a weird and strangely behaved wave-function; no one knows why. After lots of cat killing I would like to finish on a positive note. This piece has been the result of reading of the first twenty pages of the book. I am looking forward for reading more. I hope that as a historian of physics Dr. Becker will be better than as a philosopher of physics. The first third of this piece was written at a car dealership while waiting for an oil change and stuff. The second third of it was written in a traffic using a voice recognition app. Only the last third was written during a relatively stable part of a day with a manageable number of interruptions. As a person with little patience who was eager to publish this post, I may have left some typos in the text. Please, feel free to inform me of such, if you find any. I am perfectly aware of the fact that no peer-reviewed magazine will publish my piece: my writing style is too loose, and I have no citations. Well, I do, on the book I review, but the format is wrong, and other references are missing. Although, I do not really understand why does one need to explicitly show the references which are already well-known and openly available (Google-able), like "my" Max Plank's quote. Anyway, you if enjoyed the reading, please, feel free to share it with your colleagues. But maybe even more reason to share would be if you hated what you read ("I found such a piece ..., you should definitely check it").